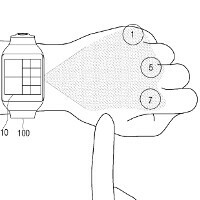 Hawk eyes have spotted a rather cool patent, granted to Samsung, involving smartwatches and a way to expand their user interfaces in a way that makes them much more usable (and James Bond-like). The listing describes a smartwatch, which would be able to scan and recognize the physical shape of objects around it, then use a set of internal projectors to beam a virtual user interface on nearby surfaces. Or, to put it bluntly, it can project its interface on top of the user's wrist, forearm, or even place virtual buttons on their fingers. The examples given show the use of a dialpad, a large keyboard, and even a map navigation, all projected on the top of one's wrist. Alternatively, menu items can be beamed across the length of the user's arm. The projected items would be interactable, with the device using a set of photo sensors to figure out where the user is “tapping”. The patent doesn't limit the device's use to just close-range arm projections. It also lists a set of uses, such as a full size desktop beamed to any wall around the user, all from a small smartwatch. But the listing goes on to say that the same tech can be applied to a head mounted display device, presumably to be used to create a mix between virtual reality and the user's natural environment – kind of like Microsoft's upcoming Hololens. Now, before you go jumping for joy, let's note that if something is patented, it does not mean that it is currently in production, or even in development. Patents serve to protect ideas from being stolen, but the fact that you have an idea for how something might work doesn't necessarily mean that you currently have the means to produce it. Talk to you later, we are on the way to patent lightsaber remote controls!